Here we go again! Another breakfast bar for the “grab-and-go” crowd. 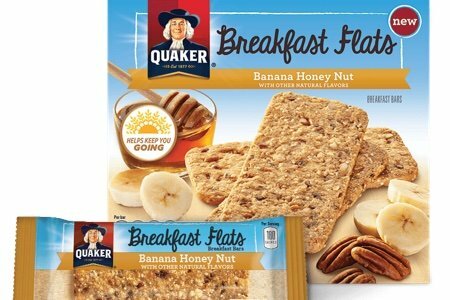 I want to like Quaker Breakfast Flats because the commercial made me drool. They had these videos of oats, nuts, and fruit, and I felt like I could smell them from my TV. Alas, I had to go buy them and open them before I could smell them. Before I found them, I was optimistic that I had discovered the breakfast bar that would solve all my problems because they included nuts (a healthy form of protein). Belvita does not have nuts and I have flamed those as dressed-up Oreo cookies (not fit for breakfast). I have highlighted the sources of added sugar because once again I have to call these cookies (which PAINS me). I want to endorse these – they are entirely whole grain, they have pecans, almonds, flaxseeds, and stuff I recognize and they TASTE good. But, 10 grams of sugar is about the same as for a bowl of Honey Nut Cheerios (without the milk) –which is simply too sweet. I actually like these as a cookie. As long as you eat one bar (not all three) this is a reasonable treat and goes well with coffee or tea (like biscotti). When are food companies going to get the message on added sugar? This “flat” comes so close to getting it right it is painful. Hello, Quaker? Cut the sugar in half please!! Have you seen these breakfast flats? What do you think? I don’t know how many of you would like a chocolate brownie that is also a healthy snack –but I guess that would be a majority. They are delicious, but I agree that one bar is plenty due to the sugar content. Just curious, is the nutritional information you list for just ONE flat or for three? I haven't seen this in my store yet, just the ad. It looks like they package 3 in a pouch....which I wish companies wouldn't do! Like you I was drooling when I saw the commercial but was also skeptical that is was a just "healthy" cookie!!! So stats are for 1 flat, yet they package 3 in a pouch. Not good, Quaker. Borderline false advertising if you ask me. Haven't seen them in the market yet, but 7 SP is way too much for one little flat. Won't be finding its way to my pantry, unfortunately. The serving size is 3 bars - so one bar is 60 calories. Given the size of each bar this makes sense to me. Thank you for your comments - this is an important part of this discussion and I should have included it above. I am going to change the post now. Only 3 grams of protein does not pass the muster for me, I would be hungry in an hour. Add in the 10 grams of sugar and I have to pass. I also was drooling during the TV commercial and made a beeline to the oatmeal aisle in my local store to look for them, but couldn't find them yet. I agree about the sugar. Thanks for the information! This has been my cry for years: "When are food companies going to get the message on added sugar?" I've contacted companies about sugary yogurt and snack bars, but it seems as if we need a more concerted effort to get our message across. Hi,I like to do this: put some fruit you like(dates, apricots, mango, kiwi, dark cherries, blueberries, peaches; I've used them all) in the blender, and add plain rolled oats, and almonds, and chia, and whatever other nut/grain you like, leave out the sugar, and puree it. Then taste and IF YOU INSIST add a drop of honey, or another date for sweetness, then dry it in the oven or food dehydrator, you end up with healthy breakfast bars that take less time than taking the box off the grocery shelf and lugging it to the checkout counter. I bet Lisa has lots of recipes to add to this. Very tasty and a great healthy snack if you have one bar at a time. I've only been able to try the Cranberry Almond bars, since the others are not available at my store. Properly planned, the 60 calories is a very reasonable snack. I agree that less sugar would be good. The only Kashi bars I like are the Pumpkin Flax ones. 1/4 of the pouch is 42.5 calories and very tasty with coffee or tea. Always too much sugar in EVERYTHING packaged. I feel exactly as many of you about the breakfast flats. They're delicious but too much sugar. I need some sugar to feel happy & energized, so the sugar content here doesn't bother me. I would like, however, to make these 'Breakfast Flats'. Does anyone know how to get this nice, crispy, crunchy texture without burning them? Thanx. These bars are excellent, but the sugar content is too high. Probably won't buy them again because of this. and ingredients because they are NOT gluten free. I just wanted to know, if the flats could take the place of a breakfast on days when I don't have to time to sit quietly and have a normal meal for breakfast. Oh well, 10 grams of sugar......I know it isn't good for me, but I love these flats. So convenient and tasty too! Guess I should try to find some sort of recipe to make a similar breakfast treat - any suggestions?